Above is the bulk of what I created over the past week using a variety of mixed media materials, buttons, and beads. Here are some of my favorites. On the left, I altered wood tubes with paint and hung a game piece from them. 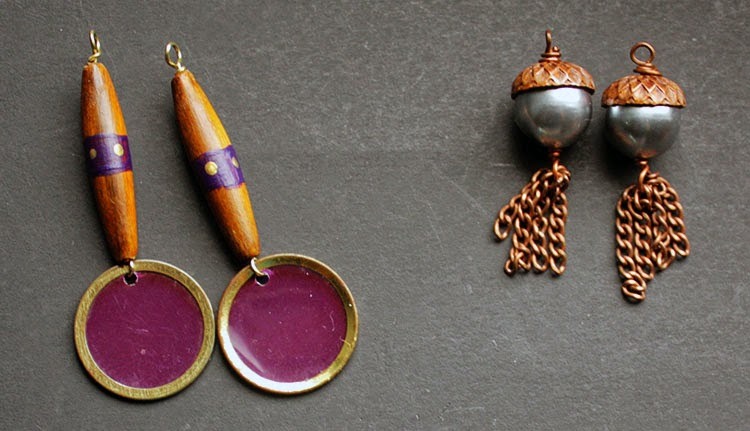 The right is more self explanatory: Vintaj artisan copper bead caps, faux pearls, and copper chain. 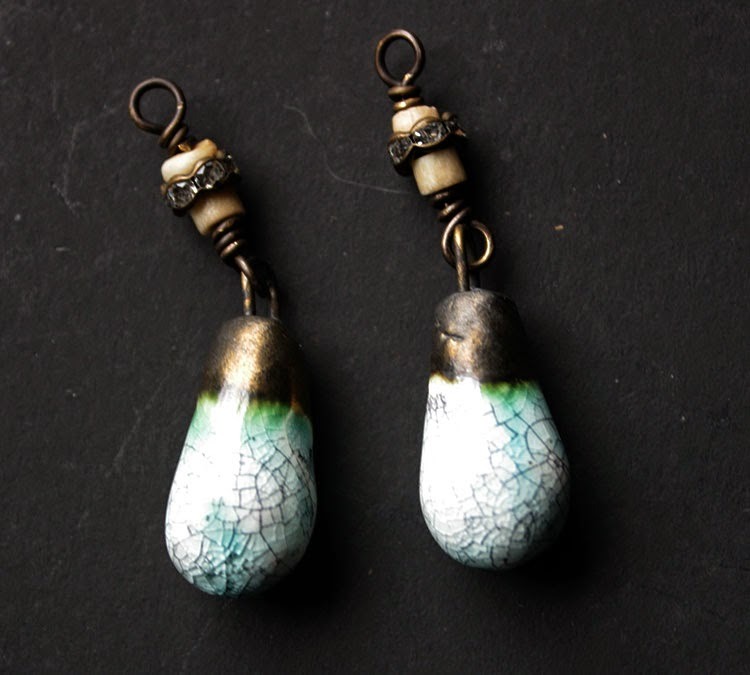 These are my absolute favorites of this round: Scorched Earth ceramic drops topped with a link of bone beads and a rhinestone spacer, strung together on Patina Queen brass wire. At some point I'll finish off all of these earrings, get better pictures, and list them in the shop, but for now I thought I'd share the eye candy. I've put the earrings supplies aside for now as they were taking up the whole of my desk, and because I think I'm well-stocked on earrings for the time being. Now to decide what to work on next. Suggestions? Wow you made a lot of wonderful earrings! You have been a busy one. 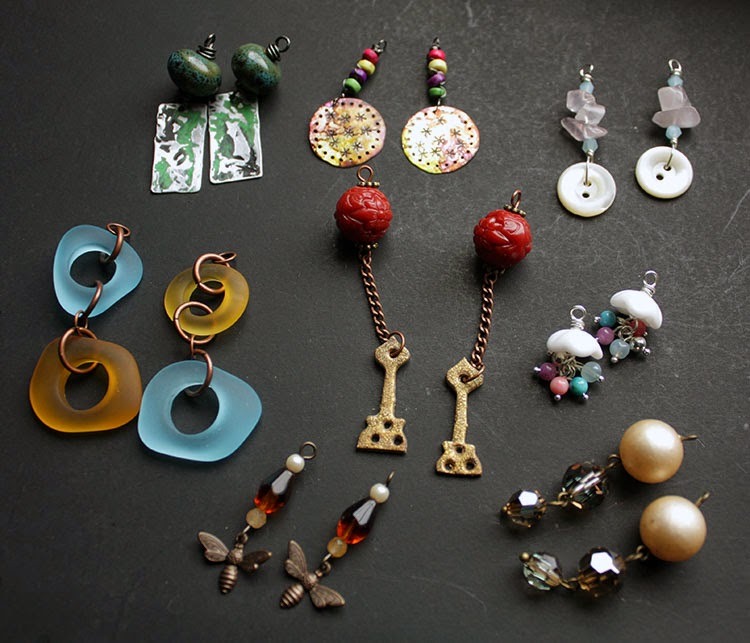 you are having fun with earrings lately! another wonderful batch, and I can see why you love those Scorched Earth ones - yowza!